The Dalian Wanda Group, China's largest property company, headed by Wang Jianlin is buying a part of Spanish league champs Atletico Madrid. The Chinese enterprise has agreed to buy a 20-percent stake in the club for 45-million euros, or a little more than 52 million US dollars. 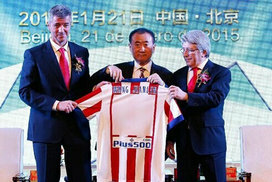 This is the first time that a Chinese firm has invested in a premier European football team. The deal is likely to be a boon for Atletico, which has racked up debts of more than 500 million euros, while also helping introduce the club to new Chinese fans and sponsors. They are the latest Spanish league team to have some foreign ownership. Recently Malaga and Valencia were acquired by non-Spaniards. And the league's two biggest clubs, Real Madrid and Barcelona are controlled by investors in Qatar and the UAE. Atletico Madrid are currently third in La Liga.